In the early 1980s, director Diego Echeverria captured five stories from the Brooklyn neighbourhood Los Sures, looking to represent the challenges it was facing; drugs, gang violence, crime, abandoned real estate, racial tension, single-parent homes and inadequate local resources. Alongside this portrait of struggle, the film also celebrated the vitality of this largely Puerto Rican and Dominican community. 30 years on from its release the neighbourhood still struggles, but the issues have changed as the area faces the force of gentrification. Also situated within the Southside of Brooklyn is UnionDocs, a community of ‘experimental media-makers, dedicated journalists, critical thinkers, and local partners’ who are currently involved in an ambitious five-year production that revisits Echeverria’s original film and repurposes it into what they have described as an ‘expansive documentary’. 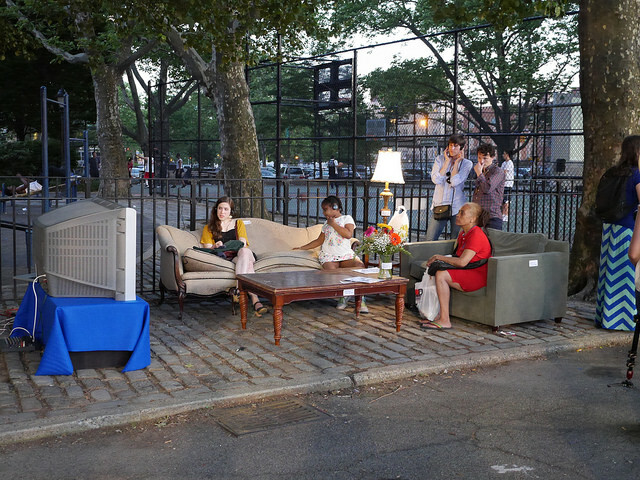 Now in its final year, Living Los Sures has been developed into four distinct projects; the restoration of the original film, the interactive experience Shot by Shot, the interactive documentary 89 Steps and the multiple documentary shorts, produced by the UnionDoc’s collaborative fellows. To add to this, they are also currently crowdfunding on Kickstarter to take the project even further. When I met with Christopher Allen (Founder/Director, UnionDocs) towards the end of last year, my focus was just on the interactive part, however I was quickly drawn into all the layers of the project; how they worked together, how they represent the collaborative nature of the organisation, how they encourage participation and approach community impact. Shot by Shot breaks the original film down into individual shots – each of which contain their own story – and presents them back through an ambitious interactive interface. Christopher described the work as ‘a fractured look at place’ which is mimicked through the non-linear, exploratory design. Where the original film focused on five subjects, this interactive take is hoping to collect 1,500 stories by the end of the project, through 320 individual shots. 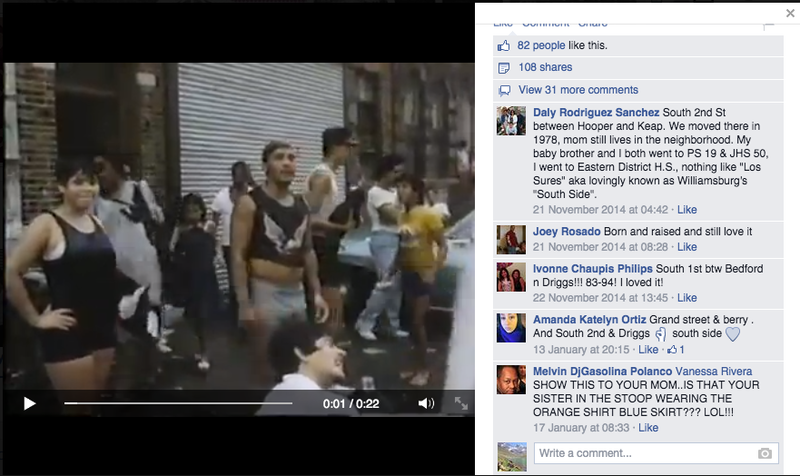 Post by Living Los Sures. Christopher explained that the idea with Shot by Shot was to get the first iteration up and working, then share content – stills and video – through the Facebook page to stimulate public engagement with the project. Christopher was full of positive stories to tell about the impact of Shot by Shot – new generations finding pieces of their family history, as well as older generations reconnecting with their past. He explained that the stories they were getting were so good, it shaped the whole concept for this part of the project. Originally Shot By Shot was going to be more of a tagged database, but the team felt it needed more authorship, so the film became the background and the shots and stories became the foreground. Shot by Shot: a revelation from UnionDocs on Vimeo. Alongside this relatively organic, participatory process, there is also a great deal of research done by the UnionDocs fellows. As well as producing the shorts, they are working to track down and conduct interviews with people from, or related to, the original documentary. It is this ground work which provides that authorship the project needs. This model for participation not only allowed Shot by Shot to grow and develop, but also fed back into other areas of Living Los Sures including the shorts: 30 short films created by the 48 artists who are part of the UnionDocs fellowship program. 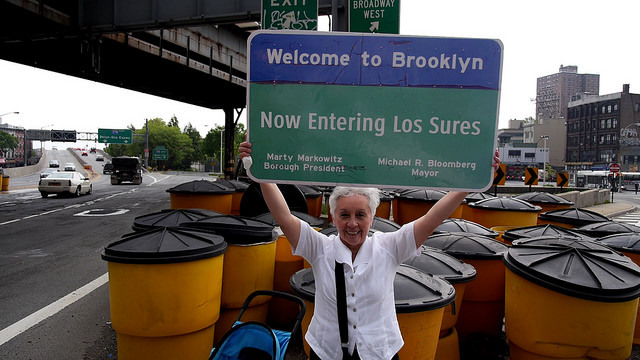 These documentaries explore what Los Sures is like today, with the fellows given focus and connections in the community to allow them to create something that still builds on Echeverria’s original work. Living Los Sures Shorts Trailer from UnionDocs on Vimeo. Although the documentary shorts have been partially released online, the only part of the project that is currently fully accessible is the interactive documentary short 89 Steps. It was released as part of the POV interactive shorts platform, which hosts a selected number of interactive documentaries. 89 Steps focuses on the story of Marta, one of the original Los Sures subjects, whose living circumstances – which haven’t changed since the original documentary – are being challenged by her age and the gentrification happening within the community. Much like Shot by Shot, 89 Steps also has a strong correlation between interaction design and meaning. For example, you begin the documentary experience by walking up the steps with Marta to her apartment and a counter in the bottom corner of your screen lets you know how many steps you’ve climbed and what floor your on. To keep her moving up, you must hold down the up arrow key on your keyboard. Having this play out in real time means, with Marta narrating your assent – checking if you’re alright to carry on if you stop holding down the key – ‘you get a sense of the issues she’s facing through the subtle use of interactive interventions’ explained Christopher. This initial set up and introduction provides some context before the main content of the story is delivered. It also sets up the interactive landscape for the rest of the piece, with most of the interaction initiated by prompts from Marta – it keeps the documentary accessible. There’s a strong sense with 89 Steps that each interactive element has been carefully considered to augment the story and create a more tangible connection with Marta’s experiences. Although her issues are individual, Marta’s story echoes that of many people from established communities who are having their futures challenged. The work doesn’t stop here; Living Los Sures extends beyond Shot by Shot and 89 Steps, beyond the Facebook posts and the documentary shorts and into real life, including community screenings and a developing education package. UnionDocs has a strong history of public screenings, often held in their own building and Christopher was keen to emphasise the importance and power of them to emotionally engage a community. These events not only served as an opportunity to show both the original documentary and the newly made short films, but also to stimulate discussion about the change in the area and raises important issues about forced migration and movement. UnionDocs are not stopping here. They are currently fundraising on Kickstarter to help realise the the final parts of the project and bring each section to a close. This is not a small undertaking – as well as finishing the ambitious Shot by Shot (which includes doing 60 more interviews) they also want produce eight more shorts, promote the huge amount of work that’s already been done and translate everything into Spanish. They also want to extend the impact of the project. Although they have already reached many members of the community and stimulated some discussion and community action, they want to create an education package which will allow the film to be used in local high schools to talk about race, economic justice, gentrification, community engagement, sustainability and civic participation. It is also a reflection of the way organisations like UnionDocs work. The collaborative nature and willingness to experiment means they are comfortable with an iterative design process, are willing to embrace a multi-faceted project and are able to take a considered approach to community participation. The outcome, even if not quite finished, is a prime example of repurposing work for new mediums and new audiences. To find out more about the Living Los Sures goals and to support the project, visit the Kickstarter.